Kenya Airways and Ethiopian Airlines are set to intensify their battle for the lucrative East and West African skies, opening new destinations and increasing frequencies in a fresh attempt to wrestle passengers from dominant European and Middle East carriers — and from each other. KQ plans to open new routes to traditional Ethiopian destinations of Ouagadougou in Burkina Faso and Luanda in Angola in addition to Jeddah in Saudi Arabia and Juba in Southern Sudan. 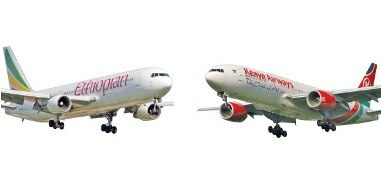 Both carriers have a similar strategy of ferrying passengers from West and Central Africa into their respective hubs — Nairobi for KQ and Addis Ababa for Ethiopian Airlines — from where they connect mostly to Southern Africa, the Middle East, India and the Far East. Ethiopian Airlines is now flying daily to Mombasa and three times a week to Monrovia; the Monrovia flight also covers Conakry in Guinea. Until then, KQ was the only scheduled operator to Mombasa, flying upto 58 domestic flights a week from Nairobi to Moi Airport. Mombasa is mainly served by tourist charter flights from Europe although relief, military and cargo flights also use the coastal town’s Moi International Airport on an ad hoc basis. Ethiopian is also flying twice daily to Nairobi following the addition of four night flights from Addis Ababa in December 2009.